When the fog rolls in... the terror begins. As the residents of the sleepy seaside village of Antonio Bay, California begin to celebrate their centennial anniversary, a thick, eerie fog envelops the shore. From its midst emerges the horrifying spectre of the victims of a century old shipwreck shrouded in mystery, as the long dead mariners return from their watery grave, seeking revenge. 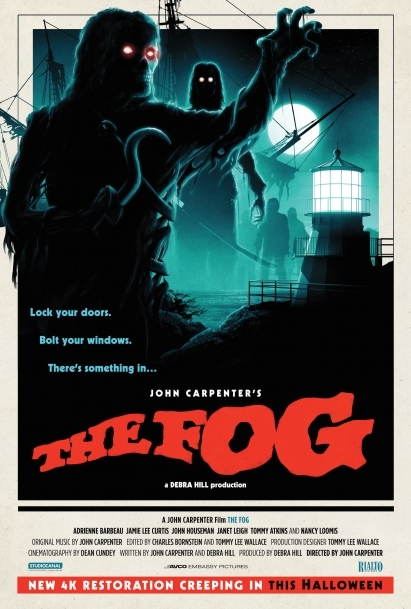 Stunningly restored in 4K, this 1980 horror classic from the master of terror John Carpenter features performances by Adrienne Barbeau, Jamie Lee Curtis, Tom Atkins, Hal Holbrook and Janet Leigh.